Succulent king prawns, mussels and calamari with risotto rice & parsley. Succulent king prawns, mussels and calamari with risotto rice & parsley. Pan cook from frozen in 10 minutes. Serves up to 3. Additional Frozen Instructions: HOB - For the best results cook from frozen. Gently shake the pack to mix the contents before cooking. For a 1/3 pack portion cook for approx 8 to 10 minutes. Place 1-2 tablespoons of water into a wide bottomed non-stick shallow pan and heat. 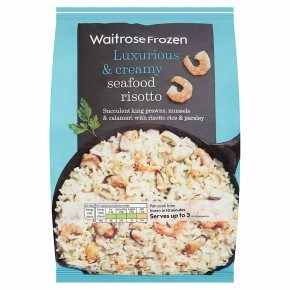 Add the seafood risotto and gently stir over a low to medium heat until the product is cooked and has no lumps. During cooking add a little more water if required. …Heat until piping hot. Serve immediately. Do not reheat once cooled.